Peter Saul is an internationally acclaimed artist who rose to fame with a strong counterculture aesthetic and a wild politically-incorrect figurative practice. Although, Saul is typically associated with the Hairy Who & the Chicago Imagists, he never actually lived in Chicago but he had only frequently exhibited there. The artist did however, live in Texas from 1981 – 2000 while he taught at The University of Texas at Austin. Although Saul lived in Texas for nearly two decades, he is not often associated with the state. While teaching in Austin, the artist had gallery representation in San Antonio in the Blue Star Complex in the 90s. Through connections with the city, Saul has greatly influenced San Antonio artists. Now in his eighties and currently residing in New York, Saul has managed to inspire multiple generations of artists, locally and around the world. John Hernandez, a San Antonio native, was one local artist who came in contact with Saul’s work when it was exhibited in San Antonio. Hernandez said he was so excited when he discovered Saul’s paintings because he connected his style to his own. Hernandez and Saul clearly share a preference for lurid colors and eccentric sometimes outlandish subjects. Fast forward a few generations later and younger artists today are still enthralled with Saul’s practice, including Megan Solis and Louie Chavez, two emerging artists who also run against the grain. United with a contrarian aesthetic, this exhibit brings together four intergenerational artists Megan Solis (b.1990), Louie Chavez (b.1979), John A. Hernandez (b.1952), and Peter Saul (b.1934) to explore artistic inspirations within similar sensibilities, specifically with an appreciation of ‘lowbrow’ imagery, critiques of popular culture, and conflicts with self that are presented with brash colors and the unexpected. Charur, Malena. 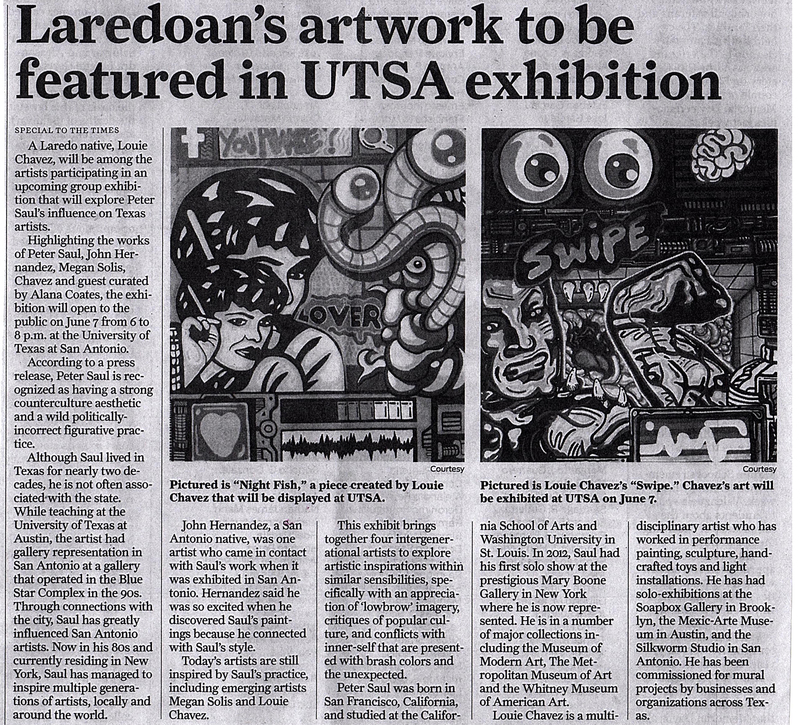 “Laredoan’s artwork to be featured in UTSA exhibition” Laredo Morning Times, May 29, 2017. Charur, Malena. 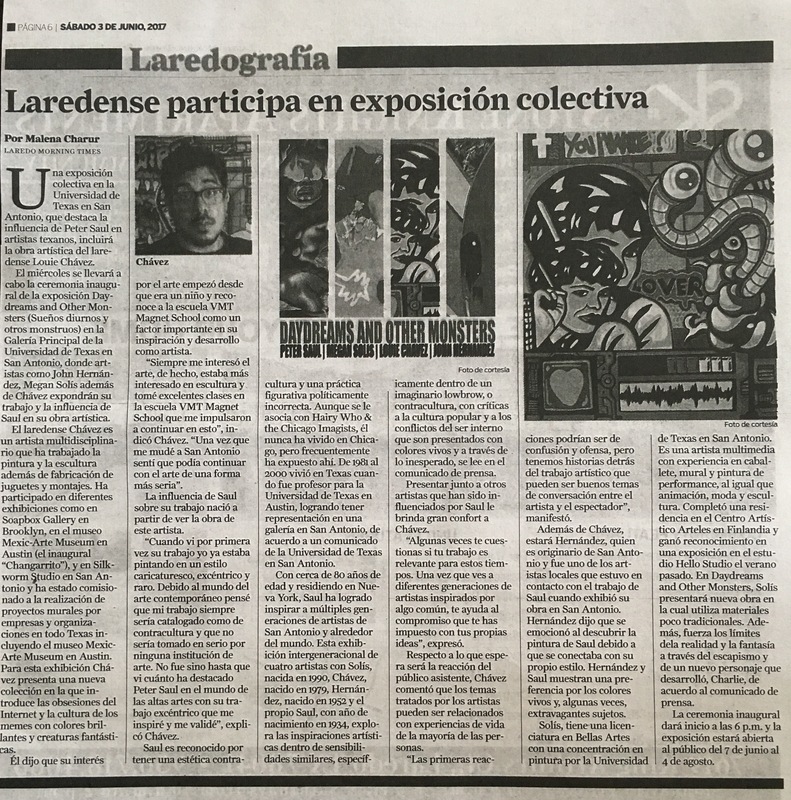 “Laredense participa en exposición colectiva” Laredografía, June 3, 2017. Courtney, James. “Daydreams and Other Monsters” San Antonio Current, June 5, 2017. Rees, Christina and Brian Scott. “Top Five” Glasstire, June 8, 2017. Villarreal, Jose. “Exhibition explores Peter Saul’s influence on Texas artists” Artdaily, June 8, 2017. Mireles, Kara. “Art exhibition curated by UTSA alumna will attract art lovers new and old” UTSA Today, June 12, 2017. Silva, Elda. “Pop art exhibit at UTSA delights and disturbs” San Antonio Express-News, June 14, 2017. Aquino, Marco, “Daydreams and Other Monsters Finds Humor in Dark Places” San Antonio Current, June 20, 2017. Rindfuss, Bryan. “35 Wonderfully Wicked Images from UTSA’s Group Show ‘Daydreams and Other Monsters” San Antonio Current, June 20, 2017. Merkner, Susan. “UTSA’s Daydreams and Other Monsters Exhibit Curated by Alana Coates” On The Town Ezine, July/August 2017. Zech, Brandon. “Review: ‘Daydreams and Other Monsters’ at UTSA” Glasstire, August 4, 2017. Art Talk with Louie Chavez and Megan Solis. UTSA Art Gallery July 17, 2017.